This map depicts the road network of Kenya, overlaid on major settlements. Roads in Kenya are concentrated in the highlands of southwestern Kenya, which is the agricultural heartland and area of highest population density, and near Mombasa on the southern coast. One can clearly see the network of highways, and primary, secondary and feeder roads in the Southwest, near Lake Victoria. The dryer northern areas of Kenya are far more sparsely populated and the road networks are less dense. Although some roads are coded as highways (in yellow), these are in reality mostly two-lane paved roads. Tertiary roads (in light gray) are generally little more than dirt roads or tracks. Kenyan road traffic is congested and dominated by overloaded and under-powered vehicles such as matatus (minivans used for public transport). The World Health Organization (WHO) reports that Kenya was ranked 25th highest in the world for the total number of road traffic deaths in 2010 and about 45th in the road death rate (deaths per 100,000 population). 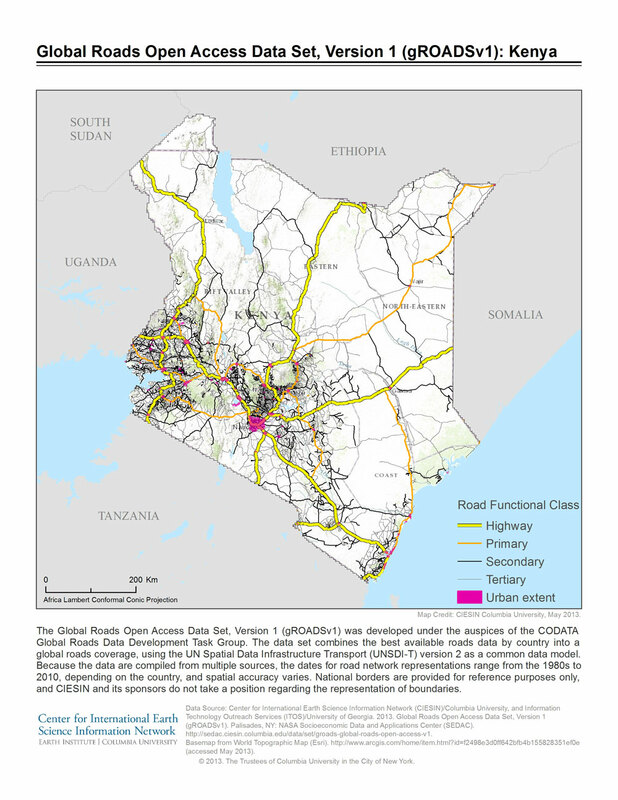 The Kenyan roads shown here are part of CIESIN’s new Global Roads Open Access Data Set, version 1 (gROADS v1), which was developed under the auspices of the CODATA Global Roads Data Development Task Group. According to the Task Group’s strategy paper, “Better rural transportation is a principal factor for improving livelihoods in developing countries through better access to markets, increased social mobility, migration, and greater economic opportunities. Good road information is important to allow local entrepreneurs to make better plans for the distribution of their products, and also to enable development organizations to assess the social and environmental impact of competing transportation strategies.” Roads data are also critical for disaster response and environmental applications, and are often very useful to the research community. For example, in the field of agriculture and rural development, research on the linkages between access and rural livelihoods has spawned a growing literature on how access—and conversely remoteness and isolation—can have important economic and social implications for land use, enterprise mix, adoption of technology, intensification of production, and the degree of participation in markets. The Kenya data are among the most spatially accurate of the gROADS global data because they were derived from global positioning system (GPS) data and painstakingly edited for internal consistency by CIESIN. The goal of the CODATA Task Group is to develop a global roads data set that is globally consistent, spatially accurate, focused on roads between settlements (not streets), up-to-date, well documented, and freely distributed. This first version of the gROADS data set meets many but not all of these goals. 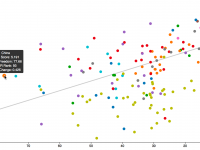 For example, the spatial resolution of inputs is variable across countries. However, gROADS v1 does represent an important first step in developing an improved “public domain” roads data set that can be applied in the ways described above. The gROADS dataset should be seen as complementary to the popular OpenStreetMap data, which, while expanding rapidly, still lacks consistent global coverage of intercity roads. Readers who have access to digital roads data for countries in the developing world in particular are encouraged to contact the CODATA Task Group. 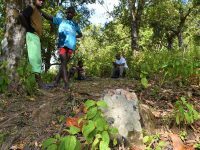 This blog is part of the Map of the Month blog series produced by the Center for International Earth Science Information Network (CIESIN). The map was made by geographic information specialist Tricia Chai-Onn. Commentary was written by senior research associate Alex de Sherbinin, with associate research scientist Susana Adamo and communications coordinator Elisabeth Sydor.